B1 Existence is inspired by Jeff Mills' Changes of Life. 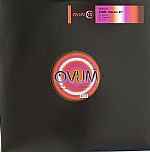 ℗& © 2010 Ovum Recordings Inc.
Matrix / Runout (Runout Side A): OVM-205 A BA98446-01 A1 BEAU. "Existence" used samples of "Jeff Mills - Changes of Life"
Part of eastern Europe's fast rising house and techno scenes, Bulgaria's KiNK shows a compulsive need to embrace all the electronic dance music styles in existence, from IDM to acid house through techno, deep-house, minimal and back again. This prolific production doesnt always hit the spot, but this strong dancefloor-orientated EP is definitely one to keep, in my opinion especially courtesy of "E79", a perfectly balanced bouncy and moody acid-influenced deep tech-house tune very well structured and developped around a delicate organ melody kept on the floor through a more ruff/trippy rythmic background cleverly playing on echoes and delays in a nice mix of old school spirit and more contemporary textures and sound production. For those who know, this is kinda reminiscent of some old Joe Lewis, or Larry Heard's more outerspace techy adventures, ie Gherkin Jerks' "Blast Off" from the classic "1990 EP", only a little more down to earth.